In 1904 Bob Nicol and Donald McColl of West of Scotland Harriers visited the Howieson brothers of Shettleston area, the inaugural meeting took place in Houston’s Tearoom in Shettleston near Eastbank Academy. Donald McColl was elected president, Bob Nicol secretary and John Howieson treasurer. A small shop in Gartocher Road, part of the Old Allan Scally Road Relay Trail, became the first clubhouse.During 1922-24 also saw J. Howieson the President of the National Cross-country Union of Scotland. 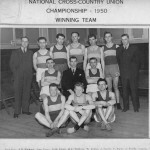 The value of winning Scottish medals in those days can be seen by the fact that the club purchased two additional team medals from the Cross-country Union for the trainers when winning the National Cross-country title in 1920 for the first time. During the twenties and thirties the membership increased and there was greater diversification into other areas of athletics such as race walking and field events. Some of the best………..
Dunky Wright, Commonwealth and Empire Games marathon champion who was such a dynamic force in the Scottish athletics scene as runner, official and reporter for nearly five decades. Jimmy Flockart, arguably one of Scotland’s best-ever cross country runners. Won the Scottish title four times between 1933-37, and became the first “home” Scot to win the International Cross Country Union in Belgium in 1937. 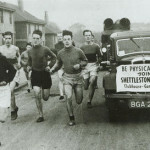 Activity suffered during the Second World War, but then, just as after 1919, the club mushroomed and from late 1940s onwards “Shettleston Harriers” has stood for excellence and consistency in Scottish and British athletics. 12 Scottish titles between 1947 and 1977including four in row (1959-62). 6 national junior titles during the same period. 22 wins at junior, youth and boys level. an unequalled number of victories in the prestigious Edinburgh to Glasgow eight-stage relay, including 11 gold medals, silver and 4 bronze. The second 50 years of the club is possibly the most notable for achievement and development. 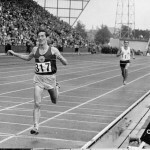 In 1954 Joe McGhee won the Empire Games Marathon in Vancouver, a race more remembered for the dramatic finish of Englands Jim Peters in a state of collapse with exhaustion. Few remember that Joe McGhee went on to win that race on that very difficult day. 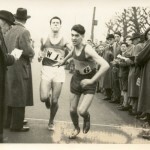 1950s dominance of the Marathon by Joe McGhee was to be followed by success in the Mile Event by Graham Everett who represented Scotland at the Empire Games of 1958. In the 1960s, Norman Foster made a great impact in Pole Vault and field events ,representing Scotland in the Commonwealth games in Jamaica. Arguably the most famous Harriers of all time were to follow in the 1970s and 80s with Lachie Stewart and Nat Muir. Lachie winning Gold in the 1970 Commonwealth Games in Edinburgh and Nat dominating the Cross Country and road scene both in Scotland and the UK. Both men were also tremendously successful on the track during this time. The appeal of Shettleston Harriers is epitomised by the fact that although the club remains rooted in the East of Glasgow, membership is far and wide, not only in Scotland but now around the world. 2002 saw a significant ‘high’ in the clubs history as we again regained our place at the forefront of Scottish Athletic honours ,winners of National Cross Country and 6 Stage Relay and in the top 3 placings in almost every other race. More to follow on our recent History…..stay tuned coming soon! !